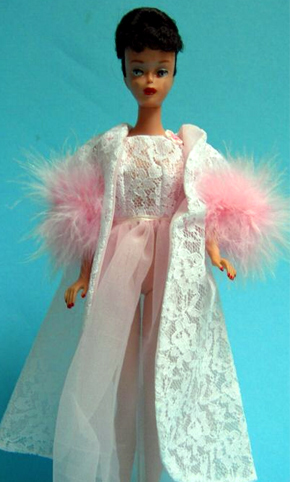 I confess that this is one of my favorite vintage Barbie ensembles - I have a major weakness for that feather boa trim! This is so elegant and beautiful, like Doris Day or some other Hollywood star would wear in a movie made in this era. 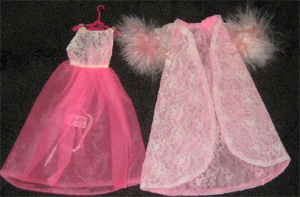 This was made in both light pink and dark pink, although the light pink seems to be easier to find. It is hard to find this in excellent condition - especially the nightgown, which frequently will have problems with the delicate ribbon straps or holes, snags or runs in the skirt of the gown itself.